This image of an M7.7 solar flare was captured by NASA's Solar Dynamics Observatory spacecraft on July 19, 2012. A gigantic sunspot unleashed an intense solar flare early Thursday (July 19), though the solar storm shouldn't pose any serious problems to us here on Earth, scientists say. 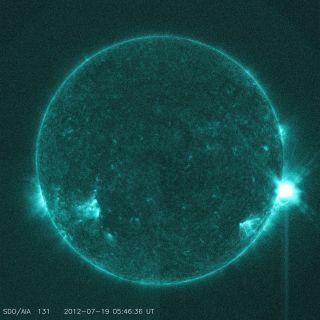 The flare erupted from a sunspot known as AR 1520 at 1:13 a.m. EDT (0513 GMT) Thursday and peaked about 45 minutes later. The outburst qualifies as an M7.7-class solar flare, meaning it's a bit weaker than the sun's most powerful blast, X-class flares. The sun storm also produced a coronal mass ejection (CME), a huge eruption of solar plasma that can streak through space at speeds of 3 million mph (5 million kph) or more. CMEs that hit Earth can wreak havoc, spawning geomagnetic storms that can disrupt GPS signals, radio communications and power grids. NASA's Solar Dynamics Observatory, a spacecraft that constantly watches the sun in different wavelengths of light, recorded a video of the solar flare as it appeared to erupt from the edge of the sun. Modeling efforts suggest Thursday's CME is not headed our way, NASA researchers said. The flare also generated a minor radiation storm around Earth, but it doesn't appear to be dangerous to astronauts or satellites. "The S1 (minor) Solar Radiation Storm persists, but should steadily decline through the day," scientists with the Space Weather Prediction Center, which is operated by the U.S. National Oceanic and Atmospheric Administration, wrote in an update today (July 20). The outburst was not the first for AR 1520, which researchers say could be 186,000 miles (300,000 kilometers) long. Last week, it shot out an X1.4 flare, the strongest of the summer to that point but not the most powerful flare of the year. That distinction goes to an X5.4 behemoth that erupted in March. After remaining quiet from 2005 to 2010, the sun began waking up last year, spouting off numerous powerful flares and CMEs. Most experts think such outbursts will continue over the next year or so. Solar activity waxes and wanes on an 11-year cycle, and scientists expect the current one, known as Solar Cycle 24, will peak in 2013.